The 1986 Department of the Army History Summary (DAHSUM) initiates a modified procedure. Previous reports depended on the submissions of the staff sections and offices of the headquarters, from which the historian fashioned a comprehensive report. In the present edition, Mr. Gough has accomplished the research himself, drawing on open sources to outline the goals of the Army leadership for the fiscal year. He then goes on to recount the achievements of the year with regard to the stated goals. The final product has been reviewed by the staff of Headquarters, Department of the Army, for accuracy. By its nature, the new approach yields a summary which does not seek to embrace the plethora of activities and actions addressed by staff in one year. Such information is available in the Annual Historical Review that each headquarters office prop duces under the provisions of AR 870-5. This classified report contains a wealth of information on the major actions handled in the headquarters. The DAHSUM provides an excellent overview of the fiscal year and can be used for orientation of new personnel. 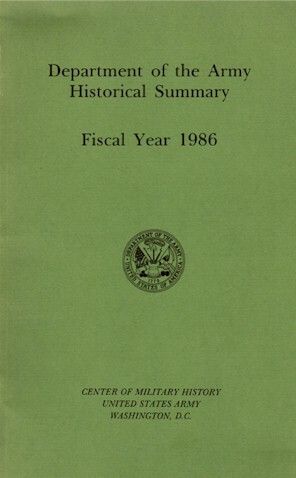 Action officers needing more detailed information for preparation of background papers and briefings should check their agency's copy of the Annual Historical Review. Between these two documents, the Army preserves a record to which our successors inevitably will turn. in future years' summaries. The purpose is to share with those not directly involved in the events the details of a significant aspect of the Army's achievements. In this case, the concern of the Army in the wake of the tragedy at Gander evoked a response that exemplified the caring nature of all those who came forward in support. The rendering of that effort is by Mr. Karl Cocke.